Police in Portland, Oregon, have arrested a man suspected of stealing belongings from one of two people stabbed to death on a local train earlier this week. George Elwood Tschaggeny, 51, was found wearing the wedding ring of one of the victims, Ricky Best, police say. Mr Best, 53, was killed when he intervened to protect two young women from anti-Muslim abuse last week. His ring and backpack were stolen after the stabbing on Tuesday. Mr Tschaggeny has been charged with theft, tampering with evidence, and abuse of a corpse. He is due in court on Monday. Mr Best, an army veteran, and Taliesin Myrddin Namkai-Meche, 23, have been hailed as heroes for their actions. The pair intervened to protect two young women, one of whom was wearing a hijab, from a man shouting abuse at them. Jeremy Joseph Christian, 35, is accused of stabbing both men, as well as another victim who survived. The news that someone had stolen belongings from Mr Best prompted an outcry and an appeal from police to help recovering the items. 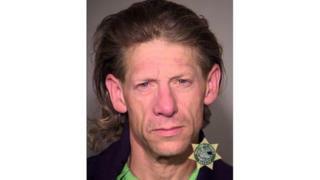 Police department spokesman Pete Simpson had tweeted: "Find this man Portland. This family has already suffered too much pain." 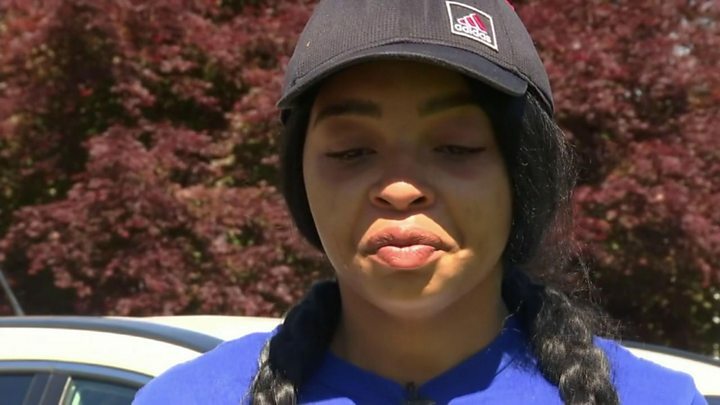 Police said they received "numerous tips" about a man matching the suspect's description, including one from a pizza restaurant employee who directed them to where he was staying. Police also recovered Mr Best's missing backpack, but his wallet and phone were missing. Earlier in the week, the accused in the stabbing incident, Jeremy Joseph Christian, appeared in court charged with murder, attempted murder, possession of a weapon and intimidation. During a brief court appearance on Tuesday, he made no plea, but shouted slogans such as: "You call it terrorism. I call it patriotism" and "death to the enemies of America".